The year 2015 marks the 70th anniversary of the division of Korea. As Catholic Churches around the world are preparing to celebrate the Jubilee of Mercy, the Catholic Church in South Korea has launched a prayer movement to remember the 57 Catholic Church in North Korea which has been suffering from difficult situations since the liberation of Korea. To introduce the “Prayer Movement for North Korea Church in My Heart” the Chairperson Reverend Father Sedoek Jeong and the Members of the Committee for the Reconciliation of the Korean People and the PD and 7 Staffs of the Catholic Peace Broadcasting Company visited our priory house. The lectures were started at 4 PM in the priory house auditorium. Dr. Kyuyeol Oh presented the “Present State in North Korea”, explaining the problems and the relations of launching the missiles and the background of the international sanctions for North Korea. Dr. Sunhee Im lectured the “Women of North Korea”, telling how much the women of North Korea have to undergoing the hardships under the dictatorship and patriarchies. And Reverend Father Hoonil Kim explained how we can be participated the “Movement for North Korea Church in My Heart”. At the end of his lecture, he gave information about Wonsan where our sisters started their religious life. He also said Wonsan was the place deep in faith for the Catholics and religious who resisted keeping their faith until the last moment. We couldn’t see at the moment the fruits of our senior sisters who lived in Wonsan spread the Words of God. 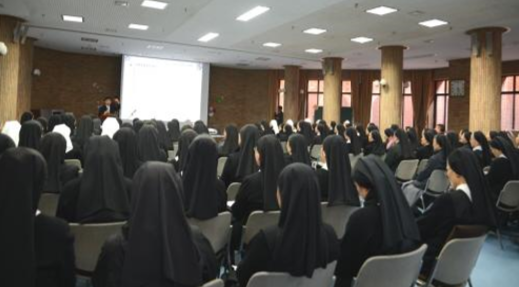 We thank God and our senior sisters for our religious life could be continued in the South. And we hope and pray that in the near future we could have our religious life in Wonsan again. The team of the Committee for the Reconciliation of the Korean People gave the same lectures to the sisters of Daegu Fatima Local House at 7:30 PM. After the liberation of Korea, there were 57 parishes and about 5,200 Catholics in North Korea. After the Korean War, however, the Catholic Church of North Korea underwent persecutions by the government. Only a few hidden Catholics are believed to be in North Korea now. The “North Korean Church in My Heart” prayer movement is open to anyone who wants to express solidarity with the North Korean Church. Participants are invited to choose 1 or more churches from the remaining 57 parishes in North Korea and say the “Prayer for Peace and Reconciliation” every morning and afternoon. Those who wish to take part in the movement can sign up on the official website (www.mynkchurch.co.kr).